A chemical peel involves the application of an acidic, topical solution to the patient's face that acts as an exfoliating agent. Once the old layer of skin is peeled, a new, fresh layer is encouraged to grow, promoting healing and restoration in the patient's face. This can be an effective treatment method to address skin concerns like acne, wrinkles, scars, discoloration, and other blemishes. Board-certified Plastic Surgeon, Dr. Amir Moradi offers several chemical peel brands and options at his practice, Moradi MD, in Vista, CA. Our highly-trained Aestheticians perform all peels and customize each service to the patient's individual need. "I have been coming on and off to Dr Moradi for 15 years or more....and from then till now certain things are a constant: the kindness and honesty of Dr Moradi, the pleasant treatment of the front desk, the positive and helpful attitude of the staff, the AMAZING facials and peel from Magdalena, the welcoming smile from Sheila and Veronica.Consistency and improvementHonesty and careThis is not a Hollywood, "make more money I don't care how they look practice"...I remember many years ago asking Dr Morasi for silicone on my lips. He looked at me and said:you will have to find another dr to do that, you will not be happy.....Thank you for that!" "I have been a client of Dr Moradi's for many years and have always been treated with respect and dignity. Sheila, who specializes in laser treatments, is lovely, and does a terrific job every time I go to her. Through the years I've had chemical peels by Sara, many laser treatments by Sheila, and have had numerous consultations with Dr. Moradi. Their location is a bit strange and tricky if you're coming from the east on hwy 78. Best to mapquest it. There is a sharp turn directly behind the Culligan sign. When exiting the parking lot there is NO LEFT TURN, which means you have to go several miles west before you can go east. I don't mind because I feel like their prices are very fair and it's worth the drive from Poway.They've recently installed a beverage center and you can make a cup of coffee or tea while you are waiting. Generally the wait is not long but I always bring a book, my knitting, or some coupons to clip whilst I wait.Lovely people in every sense of the word. I highly recommend their practice." "I did a Jessner peel last week and Miss Magdalena was taking care of me! She is a very gorgeous, sweet, experienced, and patient aesthetician I met ever! She used her smile and golden heart to comfort me and encourage me during the whole process. She totally understands that it's my first time to do the chemical peel away from my home country! To me, she is a very professional and nice lady and I definitely will recommend her to my friends in the future when they have any skin problem! I am so excited now and looking forward to seeing the result soon !!" 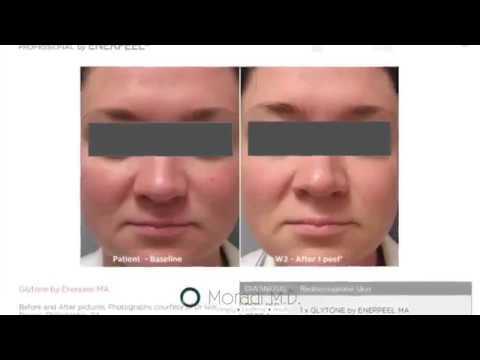 The following are different chemical peel options offered at Moradi MD. The Jessner Peel uses specific peeling agents to help lighten pigment, soften fine lines, improve texture, and clear acne. The Jessner Peel can be used for all complexions and skin types. We include a high-quality pharmaceutical Retin-A Boost for enhanced results. Most patients experience peeling 2 days after the procedure that can last for 3 to 7 days. This enhanced Jessner's formula helps to even skin tone and promote a clear complexion. This is excellent for those with dark spots left behind by breakouts. The advanced treatment booster increases exfoliation and accelerates the results. This peel is a medical grade, mid-depth chemical peel that will help to transform your skin in just one week. The Perfect Derma Peel is the only peel with Glutathione, an antioxidant that neutralizes free-radical damage while protecting cells from environmental toxins. This peel also includes Kojic Acid, a powerful lightening agent, TCA, Phenol, and Retinoic Acid to help reduce the appearance of wrinkles and correct pigmentation. Most patients experience peeling 2 days after the treatment that can last for 3 to 7 days. This peel contains a synergistic blend of gentle, yet powerful ingredients suitable for all skin types. The Vi Peel helps to improve tone, texture, clarity of skin, and acne, and reduce hyper pigmentation. The peel stimulates collagen and elastin production, softening lines and wrinkles. Most patients experience peeling 2 days after the procedure that can last for up to 7 days. Vi Peels are recommended 2 to 4 times a year. This peel is Good for sensitive skin and skin with redness. It is comprised of 40% Mandelic Acid and Visibly reduces redness. It also Minimizes photo aging and mild pigmentation in addition to Improving skin color, texture and pore size. This peel is for the delicate areas of the eyes and lips. They help to improve mild to moderate lines, wrinkles, and pigmentation. Most patients can expect minimal downtime, some swelling and flaking might occur. These peels are sold in a package of 4 and are performed weekly. The chemical application for a peel follows similar steps. The only difference will be the type of acid solution used, the amount applied, and the period of time that it is left on the skin. Once the chemical reaches the target skin layers, a neutralizer will be applied to immediately stop the effects of the acid. Downtime depends on what kind of peel is done. There is next to no downtime for mild peels but for deeper peels, the patient can be in a healing process up to 14 days. After the treatment, it is important that the patient allow the peeling process to occur naturally and do not assist in peeling or pulling at the skin. It is also extremely important to avoid sun exposure for a period of time after the treatment. If you're suffering from acne, wrinkles, discoloration, or simply desire a healthier, more radiant glow, then a chemical peel can be an effective option for treating these issues. Schedule a consultation or appointment with our San Diego office to help get you on the road to rejuvenation today.